Do fixed (Gatso-type) speed cameras prevent collisions and save lives? The authorities who operate them claim they do and, if we consider Figure 9.2, we can see there were fewer collisions in the years after speed cameras were installed, than there were in the years before. But if we look more closely we can see that the entire reduction had already occurred 6 months before the speed cameras were installed. Speed cameras cannot travel back in time and prevent collisions when they weren't there, so what could have caused the reduction 6 months before they were installed? The answer is RTM (Regression to the mean). RTM occurs because sites where speed cameras now operate were often selected following a higher than normal collision rate during the SSP (Site Selection Period) and the collision rate would therefore tend to drop back to normal at the end of the SSP. This "return towards normal" (due to the site-selection process) has been named "Regression to the mean" or "RTM". While authorities may try to install speed cameras as soon as possible, it does take some time. The Police have to record the collisions and send the information to the relevent authority. The authority has to evaluate which sites might be suitable and potential sites may need to be surveyed before the final choices are made. By the time the speed cameras are finally installed, a minimum of around 6 months have gone by after the end of the SSP. The effect of the site-selection process can be seen in Figure 9.2. The selection of these sites was influenced by the unusually high collision rates during the SSP (periods -12 to -2) and, at the end of the SSP, the collision rate dropped back to normal. It then took 6 months before the speed cameras were installed and, during this time, collisions occured at around their normal rate (red line). 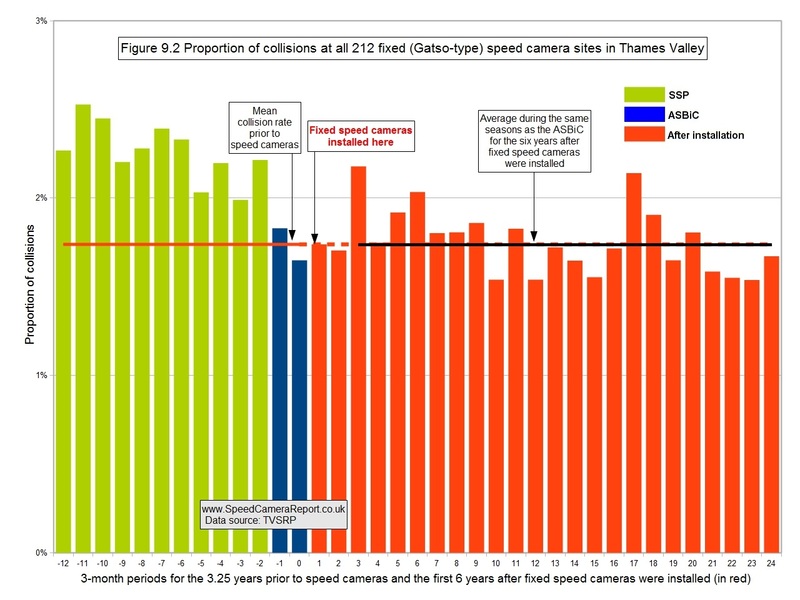 This is the rate that would be expected to have continued had speed cameras not been installed and Figure 9.2 shows that, after the speed cameras were installed (black line), collisions continued at much the same rate as before. The evidence suggests that the entire reduction in collisions at these sites was due to RTM, with the speed cameras having produced no benefit whatsoever. Furthermore, fatal and serious collisions increased after speed cameras were installed. 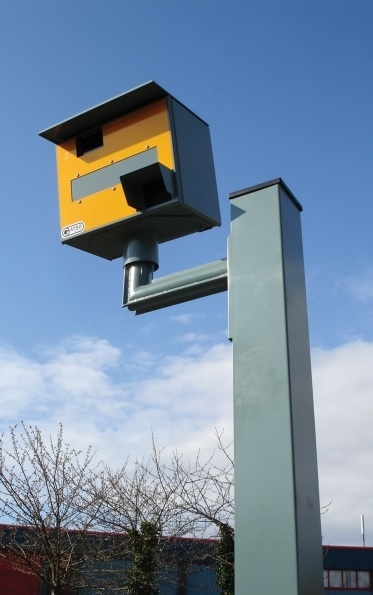 There is a simple scientific trial called a "randomised controlled trial" (RCT) that could be used to determine the site effects of speed cameras on road safety. There have been 2 systematic reviews of speed camera reports and both recommended running speed cameras within scientific trials. There have been 2 speed camera reports which have fully excuded the RTM effect from the final results (this is the 2nd), and both recommend running speed cameras within scientific trials. Still to this day, though, no speed cameras anywhere in the world have been operated within scientific trials (RCTs).